Suction Bucket Jacket on GeoSeas heavy lift vessel Innovation to be lifted and placed on the seabed at Borkum Riffgrund 2 and thereafter penetrated into place by suction inside the three foundation buckets. On 30 July 2018, the last of 20 Suction Bucket Jackets (SBJs) was installed at Ørsted's Borkum Riffgrund 2 Offshore windfarm in the North Sea off the coast of Niedersachsen in Germany. NGI with sub-contractor FRAMO were engaged by Ørsted for the suction operations during the installation campaign from GeoSea's "Innovation" heavy lift vessel. The detailed geotechnical design of the bucket foundations was performed by NGI team in Oslo in close cooperation with Ørsted. The multidisciplinary engagement in the project also included design and installation of comprehensive Structural Health Monitoring (SHM) systems on two of the jackets to monitor and verify behaviour of the structures during operation in the field. The 20 SBJs were successfully installed ahead of schedule, and an online "mission control" application allowed engineers from NGI and Ørsted to follow all details of each installation remotely from the comfort of their offices. The SBJ campaign followed closely after the separate installation of 36 traditional monopile foundations at the site. Mounting of the towers on the SBJs and installation of the 8 MW Wind Turbines with their huge rotors is now well underway. The windfarm will be able to generate green energy to supply 460 000 German households, and is expected to be fully commissioned in early 2019. - This is a milestone project for Ørsted and for suction bucket foundation technology in the offshore wind industry. After the successful installation of the suction bucket jacket prototype at Ørsted’s Borkum Riffgrund 1 offshore windfarm, the successful installation of 20 suction bucket jackets at the Borkum Riffgrund 2 offshore windfarm is a fantastic achievement which helps us towards our target of lowering the cost of energy. 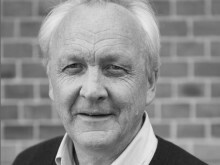 We are proud that Ørsted is leading the way with this innovative foundation concept”, says Avi Shonberg, Lead Geotechnical Engineer at Ørsted. Suction bucket technology has many advantages compared to alternative foundation methods. The remotely-controlled seabed installation is quick and efficient. Both seabed foundations and transition piece are installed together as a single unit. The SBJ foundation can be levelled precisely during seabed installation and no secondary levelling of the tower interface is required. These factors result in shorter overall installation time compared to most other types of OWT foundations. Suction bucket (or caisson) foundations are based on 30 years' experience and a proven track-record from the Oil and Gas industry. Instead of noisy hammering, the buckets are driven smoothly into the seabed using the suction pressure created when the entrapped water is pumped out from each bucket. SBJs have a minimal impact on marine life, and are easily removed at the end of their operational lifetime by reversing the installation process. Two of the 20 SBJ's and Towers at Borkum Riffgrund 2 have been equipped with comprehensive Structural Health Monitoring (SHM) Systems. The project includes a total of 325 sensors and 22 km of cabling routed through the system. The logging is handled by 2 custom-built high-end DAQ systems. The monitoring systems allow Ørsted to carefully monitor and verify the behaviour of the jackets during the operational lifetime of the wind farm and will in addition give valuable information for further optimisation for future projects. The instrumentation and monitoring systems were designed, installed and delivered by NGI, based on successful application of the technology on the Borkum Riffgrund I pilot project. FRAMO and NGI will demonstrate a fully-operational SBJ model during ONS in Stavanger on FRAMOs exhibition stand. 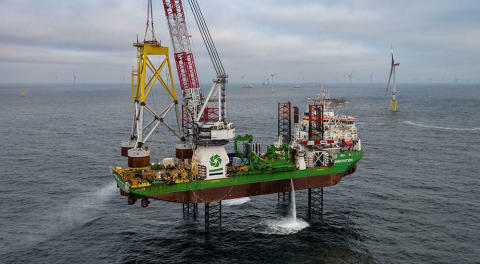 On behalf of Ørsted, the first of 20 offshore wind turbine foundations using suction bucket technology (SBJ) has successfully been installed in the German sector of the North Sea. “We are happy to finally see the first installation in place. Now we want to make sure that the installation phase is executed in the best possible way,” said Peter Buhl, SBJ foundation project manager at Ørsted.